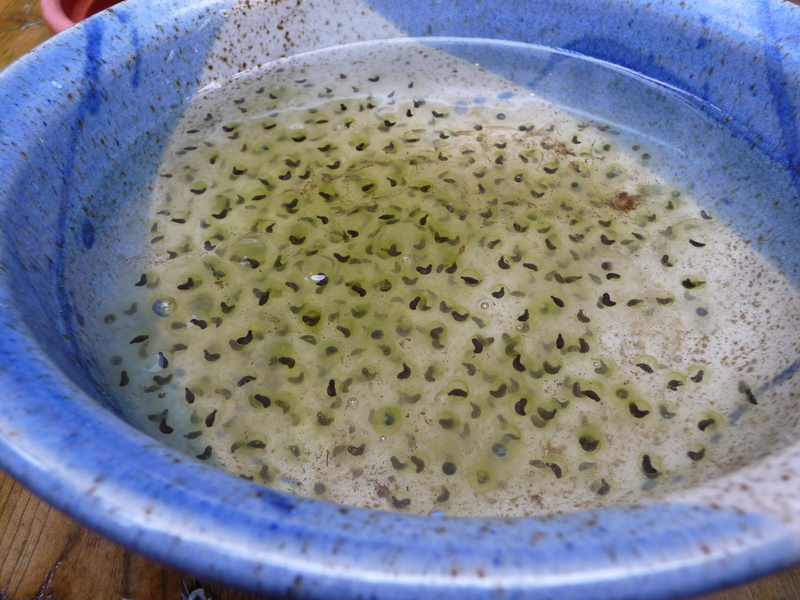 Every year I collect frog eggs to bring home to watch the process of transformation happen in a big Chinese pot on my patio and every year I’m surprised again by how mysterious and beautiful the clumps of jelly are, dotted with dark commas, hanging from a reed in the vernal pond near us. That pond dries up by mid-July and in the last few days of its water, the garter snakes glide out over the mud to the remaining pools and eat the tadpoles, many of which have their legs but haven’t yet metamorphosed to frogs. Or salamanders – because the long-toed salamanders lay their eggs in the pond too. Often a pair of mallards courts among the reeds, flying up in surprise when we pass them on our walk. And two summers ago, we saw a pair of coyotes drinking there, no doubt the parents of the juvenile who visited our garden every morning for a week, holding down salal bushes with a forepaw while it ate berries with a delicacy I didn’t expect. I think these are red-legged frogs in waiting and soon there will be tree frog eggs as well to scoop up and bring home to the old bathtub by the garden. And our own tree frogs, the ones in the vines by our bedroom window, will creep down to lay their eggs in a tiny pool under the arbutus tree. Here are today’s eggs in a blue bowl, as rich a sign of spring’s abiding fertility as any. ~ by theresakishkan on March 28, 2012. This entry was posted on March 28, 2012 at 11:27 pm and is filed under Uncategorized.You can follow any responses to this entry through the RSS 2.0 feed.You can leave a response, or trackback from your own site.